SHABQADAR: Following reports that a native of Bajaur Agency studying at a varsity in Karachi had been found dead with torture marks, residents in the agency took to the streets to protest against what they claimed was an extrajudicial killing similar to the one of Naqeebullah Mehsud a few weeks ago, according to a report by a private media outlet. On Tuesday morning, locals from Mamond Tehsil gathered at the second largest market of the agency, Anayat Kali, to stage a protest. The large gathering saw local leaders of several political parties and trade unions participate. They also closed down roads leading to and from the market. The protestor held aloft placards and banners inscribed with demands for justice and to arrest the culprits responsible for Ahmad Shah’s death. They also raised slogans against the Sindh government and Sindh police and demanded that the Supreme Court chief justice take notice of the incident. 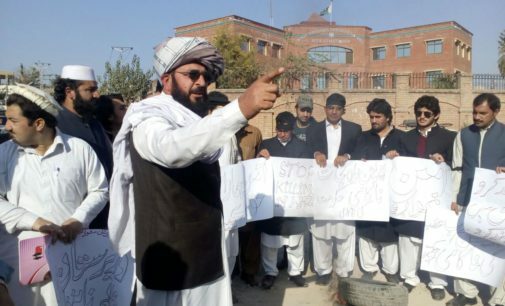 The protestor complained that most educational institutes in Bajaur Agency had been damaged because of the militancy and that the agency has no higher education institute, forcing youngsters to move to other parts of the country to seek higher education.